You know those little games people like to post as their Facebook statuses? 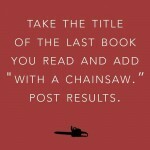 Well, last week, this one led me to “The Nonviolence Handbook… with a chainsaw.” Apparently, things either got out of control quickly or The Nonviolence Handbook is very into ice sculpture. 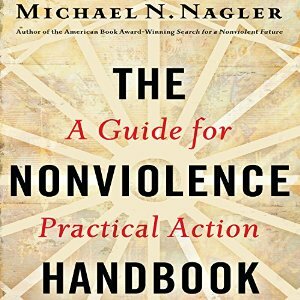 Jokes aside, for those who have not looked at the details of what “nonviolence” (comparable to Sanskrit: “ahimsa”) can be and how it can be lived / its techniques applied on both the grand and interpersonal scales, this guide is incredibly thorough in relatively few pages. For those who have already read some of Nagler’s other works (including his Metta Center for Nonviolence website), you’ll find that the book tends to just repeat what Nagler already says for free (which isn’t necessarily a bad thing). After a general overview, Nagler describes the importance of having “Right Intention” and “Right Means” when aiming to engage in nonviolent direct action. Being among those who have previously read his website, I was surprised to hear such “Buddhism-evoking” terminology. When I last looked at Nagler’s work, aside from having “metta” in the name of his nonprofit, there was not much direct reference to any kind of Buddhism. Now, however, there seems to not just be terminology and symbols on his website (e.g. there’s now an image of Gautama Buddha on the landing page), but a deeper integration of seminal Buddhist ideas in his conceptions of nonviolent action. “Right Intention” includes recognizing the interconnectedness (i.e. dependent arising) and fundamental “sameness” (which can be evoked through the concept of sunyata) of all people and using this as a logical springboard into minimizing harm to all involved in a conflict (i.e. the First Precept) by the respecting of everyone’s humanity and pride in a conflict (including yourself and your enemies). It also includes various suggestions on how to develop mind states and habits that encourage such an outlook. While he mentions “avoiding all media,” which I don’t think is necessary and I honestly kind of roll my eyes at, he also mentions – you guessed it – meditation, which he emphasizes need not be religious. He does not mention “metta meditation” by name, but it’s clear that that specific style of meditation would encourage his “Right Intention” and he knows that enough to even add “metta” to the name of his nonprofit. For those who aren’t familiar with the term/ philosophy of Satyagraha, and especially for those who forget about or neglect the element of constructive program (basically building a better replacement for whatever structure you are fighting so that there’s not a vacuum of services after success), this section will be extremely thought-provoking and transformative. Nonviolence should not be passive. It should be constructive (i.e. constructive program, or building a better system to replace the existing one) and directly obstructive (i.e. there should be direct action). It’s not a last resort or the technique of the weak; it is a lifestyle of the strong. The book wraps up by emphasizing that it is best / most effective to control your anger or channel it into nonviolent direct action instead of just screaming as much as you can no matter what (a complaint I often have about online-only activists). Also, nonviolence should be a lifestyle and not just a set of tactics (which is very in line with Buddhist thinking). Finally, there is also a whole chapter of just quotable quotes from the book (and to be fair, there are many) and information on Nagler’s background (which is pretty impressive).